He has coined the phrase ”Multiple Tunguska Bombardment” to describe the worst nightmare which, he believes, will eventually happen. Tunguska refers to a Siberian River near which, in June 1908, a 100 yard body from the Taurid stream ploughed into Earth, exploding and devastating an area 25 miles wide with the impact of a 20-megaton bomb. Fortunately the encounter occurred in an unpopulated part of the globe but if the impact had been on London it would have devastated the city, killing millions. The Tunguska event may have been only a chance occurrence. Yet, according to Dr. Clube and Dr. Bill Napier, of the Royal Observatory in Edinburgh, the history of Earth is littered with subtle evidence that cosmic debris have consistently intervened, often with catastrophic consequences. One of the most popular theories to explain the sudden demise of the dinosaurs is that, 65 million years ago, a huge asteroid ploughed into the planet, triggering either a nuclear-style winter or huge fires. This popular theory was given a boost when scientists at the University of Arizona reported the discovery of an apparent 180-mile-wide crash site in the Caribbean of an asteroid six miles wide. They claim this could be linked with the great reptiles’ extinction. Dr. Clube ascribes other events including the Old Testament story of Noah and his Ark to a Dark Age linked with colliding heavenly bodies. He also believes that climatic changes, including fears of present global warming, may have a cosmic component. There is sufficient evidence, he says, to indicate that collisions happen within centuries and millenniums rather than millions and billions of years, with multiple encounters more likely than skeptics claim. Dr. Clube emphasizes that predicting when a bombardment may occur is impossible without more scientific evaluation of the Taurid stream. 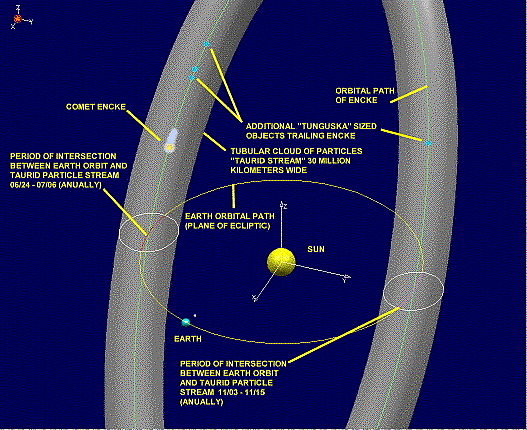 ”We are probably a little safer at the moment because the intersecting orbits are far away. But we are on the inward run and in 500 years we will start getting close again,” he says. According to Dr. Clube, the last time that the stream was closest within Earth’s orbit was in the first millennium BC, from about 500BC up to 0AD, the time of Christ. The Oxford astrophysicist is not alone in his views. Similar concerns were echoed by the respected American Institute of Aeronautics and Astronautics (AIAA). The institute is calling for studies aimed at defending the Earth from asteroid attack, including the possible redeployment of nuclear weapons to shatter incoming celestial bodies. The call comes in the wake of thawing East-West relations and what is being claimed as a recent, potentially disastrous near-collision. In 1989 a cosmic boulder bigger than an aircraft carrier, passed within 400,000 miles of Earth, a mere whisker in astronomical terms, before being noticed by astronomers. ”Such an object could cause a disaster of unprecedented proportions if it had struck. Although the probability is very small, its consequences in terms of the causality rate could be enormous,” the institute argues in a paper it released about the problem. Apart from putting nuclear warheads on standby for intercepting and shattering asteroids, the institute is calling for studies into power units that could attach and divert the celestial boulders away from Earth. ”We have the technology needed to detect and track such an object and possibly to divert if from an impending impact. We would be derelict if we did nothing,” the institute says. Dr. Clube is hoping to get access to an infra-red telescope to study the Taurid stream during the November crossover. In 1983, a satellite revealed what appeared to be dust following Comet Encke, but some scientists, including Dr. Clube, now believe that this contains the single large missing body, perhaps as large as 20 miles wide, shrouded in dust and boulders. The best chance of detecting the defunct comet might have come in 1994 when the American National Aeronautics and Space Administration (Nasa) launched the infra-red telescope, ISO. This is a great write up, however I have one clarification I would like to make in the spirit of unbiased reporting. It is stated in the description of the Tunguska incident, “Tunguska refers to a….100 yard body from the Taurid stream….exploding and devastating an area 25 miles wide with the impact of a 20-megaton bomb” and I believe this induces a mindset that resonates throughout the entire passage. It should be made clear that the devastation was created by a mid-air burst and not a direct impact, which greatly affects the spread and type of damage incurred as well as the effect on the global climate. Granted, a barrage, I am interpreting as a dozen or greater, would cause substantial change to the global climate; but a few would be mere flesh wounds in the grand scheme of things.